What The Heck Is The ‘Mae Hong Son Loop’ Exactly? 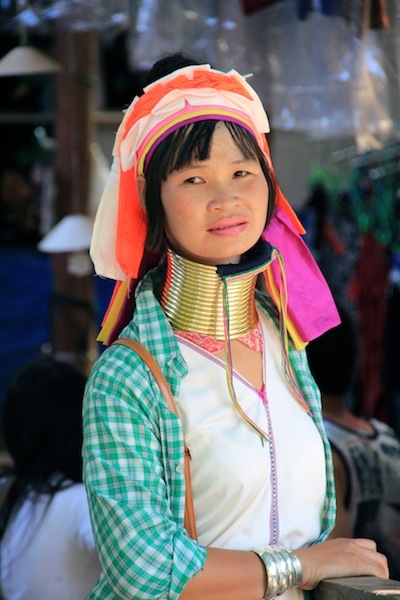 … the loop takes curious travellers by car or motorbike, to the peak of the tallest mountain in Thailand… through remote scenic villages… to the Karen Longneck Hill Tribes, and exposes those who dare to challenge the 1864 bends and curves of the loop – to some of Thailand’s most scenic and jaw dropping scenery. 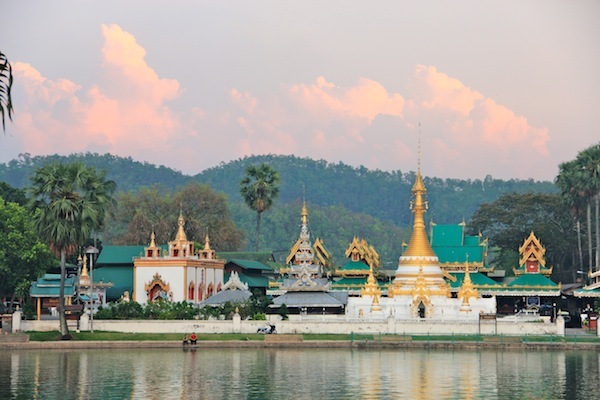 In a sentence… the Mae Hong Son Loop is an epic, once-in-lifetime road trip adventure. 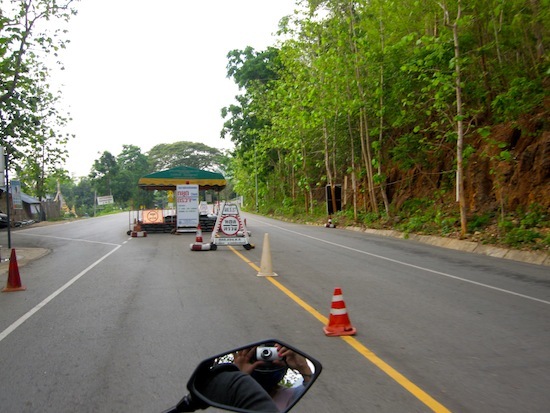 We did the Mae Hong Son Loop by motorbike… our Trip commenced clockwise from Chiang Mai & included a detour to Mae Sarieng as an extra leg to the journey. 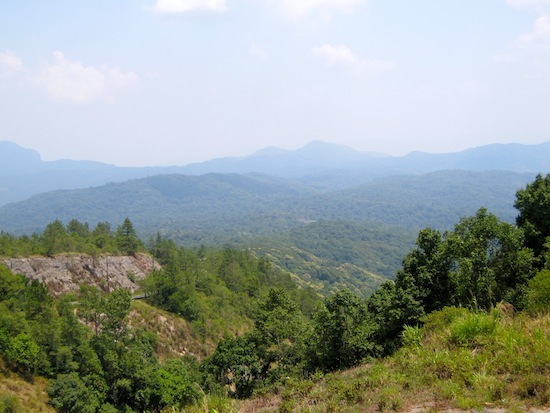 Mae Hong Son Loop – Day 1. Before setting about finding a reliable motorcycle hire shop to secure a bike for the next 5 days… a bike that would pack enough grunt to tackle Northern Thailand’s near vertical roads… and preferably have a plush, very spongey seat to help absorb some of the bumps along the way. 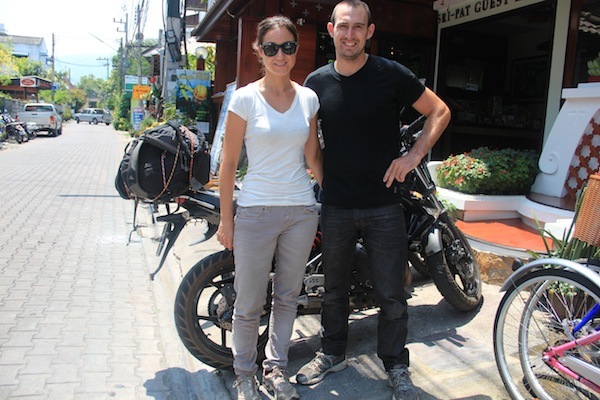 We called Joe from Joe’s Bike Team (a friendly German guy living in Chiang Mai for 20 years) who assured us he could have the perfect bike ready for us that afternoon. A little excited, we immediately went to see Joe & inspect our machine… a shiny 650cc Kawasaki ER-6n road bike. So you can ride the loop in two directions depending on which way you leave Chiang Mai. … towering 2565 metres above sea level. 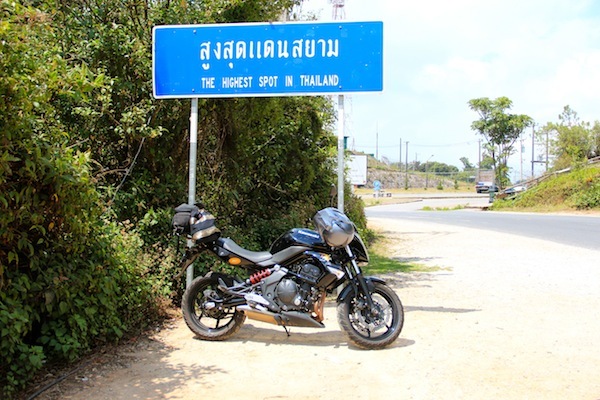 … and as the sign at the peak accurately points out is “The Highest Spot In Thailand”. 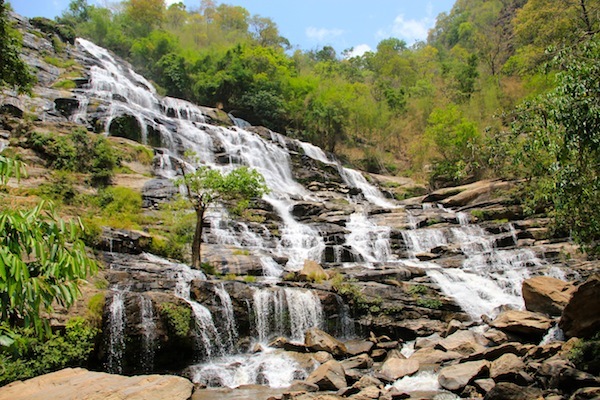 Before stepping foot on the highest place in Thailand however… we had a detour to make to check out the Mae Ya Waterfalls… definitely worth a mention, as they’re among the most spectacular waterfalls that we’ve come across in Asia. … and the perfect road to get properly acquainted with our new bike. 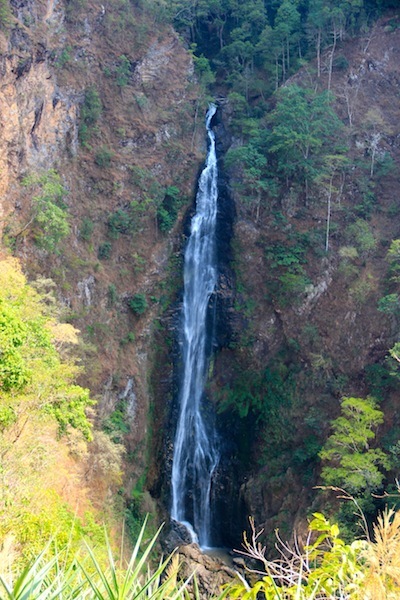 We were fortunate enough to have the Mae Ya falls exclusively to ourselves… not bumping into another soul for the 30-45 mins we spent there… which we found quite remarkable considering they’re under an hours drive from Chiang Mai. Before continuing our journey to the loftiest point in all of the Thai Kingdom… Doi Inthanon Summit. The ride up to the peak of Doi Inthanon was nothing short of splendid… the air cooled to a more & more ridable temperature the higher we climbed as a result of the altitude… and the cool riding conditions were a welcome relief from the searing temperatures of Northern Thailand’s summer heat. … the shadows coupled with the cool – high altitude air… covered my redenning arms with goosebumps in no time at all. An unexpected reason we should have worn our long sleeves… for cover, not just from the heat but from the cold too. At the top of the Doi Inthanon, we were met by a small Tourist Centre (which was closed), and to be frank – a less than spectacular view. The view was more impressive at the viewpoint 1km or so down from the peak. … this is where the road got a little nasty for the first time. We were forced to slow to between 60 – 80 kms through this stretch – to avoid falling victim to the many potholes and dirt patches so we wouldn’t come unstuck. 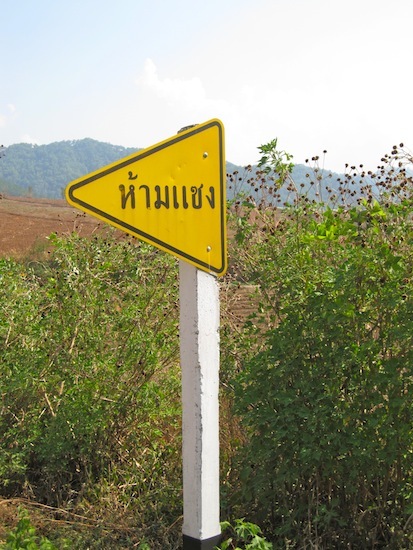 While on the subject of rough Road… neither Anna nor myself speak or read more than a few words of Thai – but we quickly learned the English translation of this road sign – would have been something like this “slow down idiot, there’s a bloody tight bend coming up”. The black clouds of death rolled in, and the heavens opened, dumping water on us… & all our gear for the next 30 minutes or so. That we had incidentally been lugging around in our backpacks since the last time we got caught in the rain on a motorcycle, in Vietnam. It brought us great satisfaction to get some use out of our cheap, crappy poncho that we’d dragged around half of Southeast Asia. Rightly so – the driver (me) got preference so we made a quick pitstop on the side of the highway to don our extensive, very advanced and stylish wet weather gear (I put my poncho on) and slowly pulled back onto the road as the first few drops splattered on my visor. Thoughts swirling around our heads of how happy we’d be to get to the bottom of the mountain… in once piece, wet, but not wet and grazed from head to toe. The rain did pass, not long before Mae Sarieng… the tiny town with a checkered past we were destined to spend our first night – wet and exhausted but with spirits firmly unbroken. 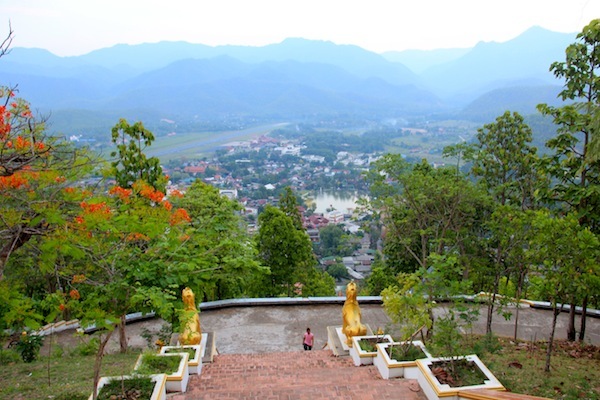 Mae Sariang is overlooked by many travellers undertaking the famous Mae Hong Son Loop, and was, until the sealed road came through, we were told… part of a well known drug smuggling route used by the drug lords of the infamous Golden Triangle. We got a room at the River Hotel, a timber lodge style building backing onto the river. We deployed our backpacks resulting a backpacking gear explosion, with clothes, both wet and dry dangling from anything inside the room that remotely resembled a hook. A piping hot shower lifted our spirits… by far the best remedy I know for a cold & slightly miserable mood. Very faint but definitely not a figment of our imagination… a scratchy, rustling sound from the general direction of the air conditioning duct. Barely breathing, we both froze on the spot, letting time pass… knowing the little stowaway would give away it’s position sooner or later. Then a soft squeal making it official… we wouldn’t be the only ones calling this room home for the night. The hotel offered to switch us to another room but we were too exhausted to bother. During the walk home from our dinner of ‘ole faithful’ pad thai noodles.… the entire town was plunged into darkness as the power was wiped out. We managed to stumble home using a phone as a makeshift torch to find our hotel illuminated by dozens of candles (hardly the safest light source in an entirely wooden building we thought). Then I assured Anna it was every man (or woman) for himself if the place goes up in flames – before drifting off into the kind of deep & peaceful sleep that you’d happily pay a large sum of money for on those frustrating nights when your brain refuses to switch off and let you rest. It turns out, by a stroke of luck… with some assistance from our Bear Grills survival skills, we managed to survive the night in our mouse ridden, inferno magnet of a room. Early in the morning, stocked up on supplies from the 7/11 we made tracks out of town… towards yet another waterfall after filling the Kawasaki’s thirsty fuel tank. 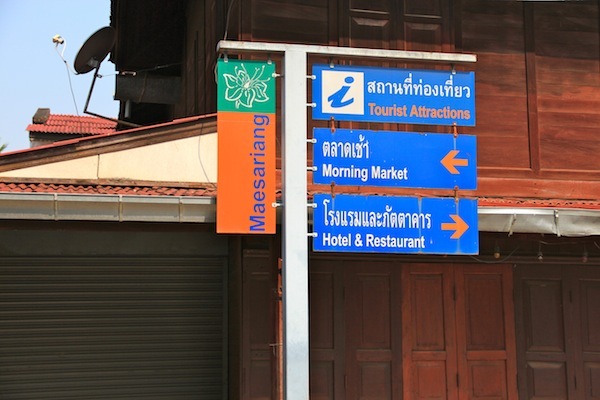 … little did we know, outside of Mae Sarieng things were about to take a change for the worse. Mae Hong Son Loop – Day 2. After a brief stop in the town of Khun Yuam for lunch, we continued onwards & upwards… on a mission to reach the Mae Surin falls. 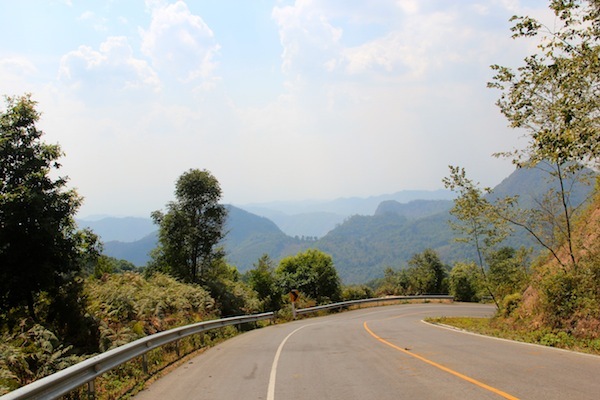 Let me tell you… from avoiding the grimy loose gravel… to dodging huge potholes & even the odd Cow or Water Buffalo… made negotiating the unpredictable hairpin turns a white knuckle ride – in what feels like the most isolated part of the entire Mae Hong Son Loop. 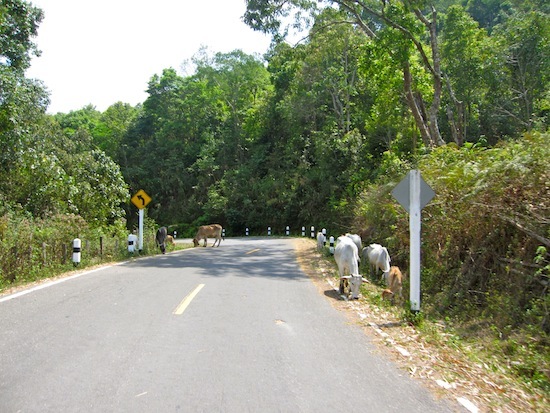 The Perilous Rd To Mae Surin Falls – Note The Livestock! 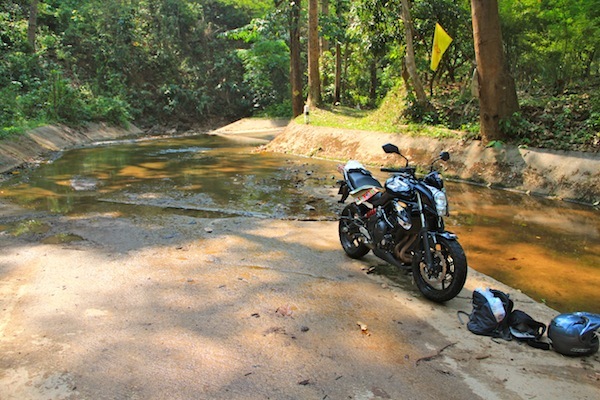 Although a bit unnerving in parts… it was also a very rewarding ride, offering some of the most beautiful scenery Northern Thailand has to offer – while the road is still good enough to enjoy the ride anyway! 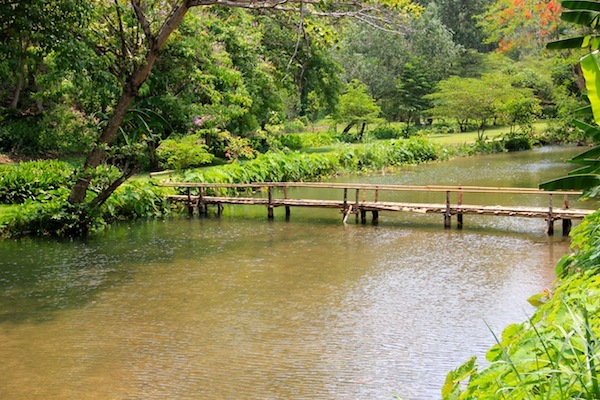 If you’re looking for a quiet place for a picnic… they don’t get much quieter… with the exception of a few groundsman, ours were the only voices to be heard at Mae Surin. … or your’e a bank robber looking for an inconspicuous hideout… you can even spend the night in a bungalow at the falls. You’d be a braver man than I… the place was a ghost town during the day – so merely imagining the kind of deathly silence that I’ve never known… blanketing the area in the dead of night is enough to give me the creeps. Frankly, the falls themselves are hardly worth the effort – as you can’t get close enough to really get an idea of their scale… there’s a viewing platform which offers views, though they’re hardly spectacular. … fighting our way over every inch of lousy road, as if the potholes & livestock weren’t enough… again some nasty looking rain clouds closed in around us. Nudging the Kawasaki on a little harder, thankfully… this time we just kept out of the rains reach… just catching a few drops on my visor. The perfect recipe for a thrilling ride… weaving around the curves as fast as I would dare with a passenger on the pillion seat. As we rounded the bend, and the workers came into view, my eyes darted over to the team and in a split-second the Kawasaki had flicked over in their direction… as though for a moment my eyes had taken over the job of steering the bike. … the poor guys eyeballs doubled in size when he first saw us screaming around the bend towards him… his reaction was to freeze on the spot & brace himself… clearly terrified that some crazy tourists on a hired motorbike were about to slam right into the side of him and ruin his day. I couldn’t help but have a chuckle to myself after turning back briefly to see a few of his co-workers having a laugh at his expense for getting spooked by a couple of tourists on a motorbike. 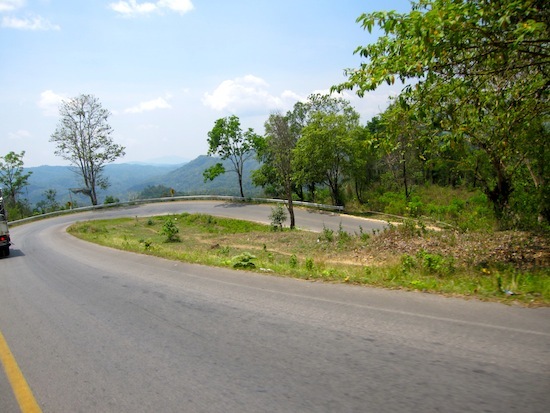 The thrills not over yet… a few more kilometres down the road… not far out of Mae Hong Son, we rounded another high speed bend and whizzed past a huge, thick, black snake winding his way along his own adventure on the Mae Hong Son Loop. We had mixed feelings about reaching Mae Hong Son, as for us, it signalled well over the half way point of our great motorcycle adventure. 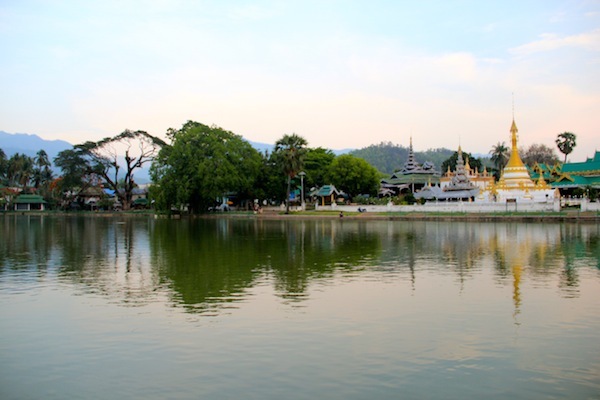 Mae Hong Son itself is a small and breathtakingly pretty town, extremely close to the Burmese border… flanked by mountains on all sides, it’s hard to find a non-flattering view of the little town in Thailand’s remote north. 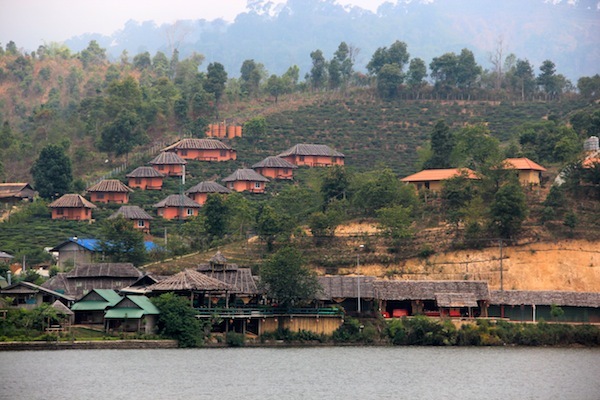 We made our way down to the picturesque Jong Kham Lake, and booked into Piya Guesthouse. 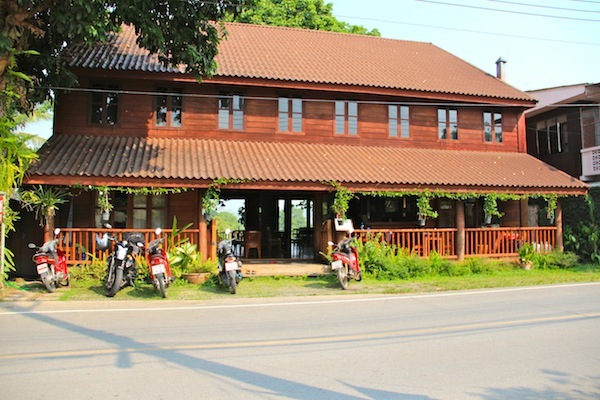 A sweet little guesthouse with lovely hosts and in an excellent location. As night falls over Mae Hong Son… Piya Guesthouse shares its street with the local night market that’s pretty cool for a short wander through on the way back to the hotel at the end of the night. Mae Hong Son Loop – Day 3. We fired up the trusty Kawasaki the next morning – to visit the village of Huai Sua Tao… determined to see the Karen Hill Tribe people in the flesh. The Karen Longneck Village happens to be located at the opposite end of up to 12 notoriously slippery and perilous water crossings. The streams that must be traversed to reach the village have been “cleverly” sealed with concrete… however with only a few inches of water flowing over most of the concrete crossings year-round… the environment is perfect for slippery green moss to flourish. After stopping to inspect the first crossing thoroughly… we deemed it safe enough to cross (experts in water crossings that we are) our barometer (gut feel) for evaluating how safe the crossings were, turned out to be spot on… we got through without a hiccup. I felt the back wheel slip a little on the 2nd crossing… but managed to keep the bike upright. We motored through the 3rd, 4th and 5th streams all uneventfully. Riding in very slowly at about 10 – 12kms per hour in second gear… and began tediously negotiating the ever-so-slight left hand bend. Quick as lightning… the back wheel came out from under us, and our trusty bike was laying on it’s side in the river. I hauled the bike up out of the water quickly and pushed it out onto dry land to inspect the damage. … and when I kicked the stand down and the bike tilted slightly, black oil poured out onto the ground & I knew instantly… we weren’t in Sh%t creak, but we had just fallen over in it. 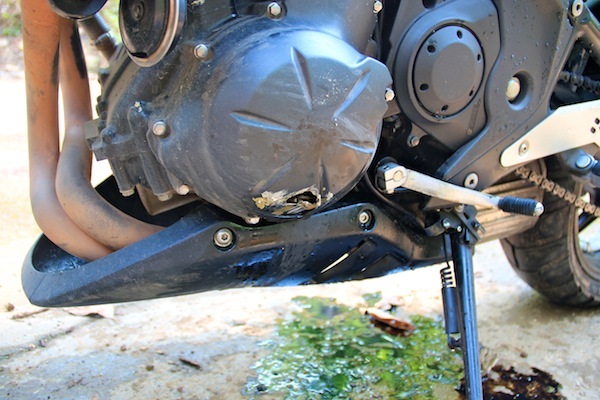 The bike’s engine cover had taken the brunt of the fall… and the short slide on the concrete had smashed a hole right trough the aluminium engine cover. We weren’t going anywhere in a hurry. We hailed some passers by and used their mobile phone to call Joe back in Chiang Mai with the phone call I never wanted to make. ” Ah… um… Joe, something’s happened – but don’t panic it’s not that bad”. Joe was really understanding and insisted he come all the way out himself from Chiang Mai to collect the broken bike and supply us with a replacement bike. With our helmets in hand, and my self esteem in tatters… we did the last 1km to the Karen Tribe on foot – including the remaining river crossings that were almost too slippery to pass when you are in hysterics of laughter. 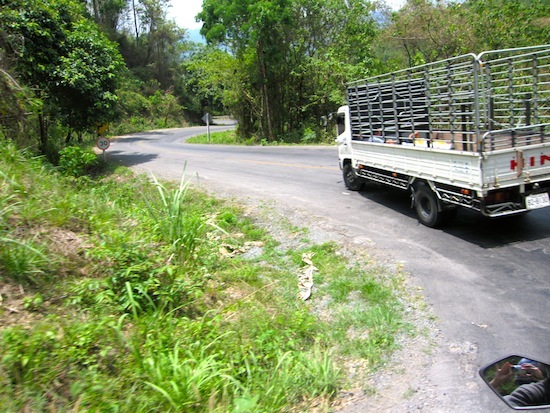 … then we headed back to see what we could do about getting back to Mae Hong Son. The gentleman who sold us the tickets to the Long Neck Village (250B ea – not much is free in Asia) took it upon himself to ensure he got us & our bike back into Mae Hong Son. Before organising a ute though… he absolutely had to inspect the bike himself – this is where I got a crash course on crossing the rivers. 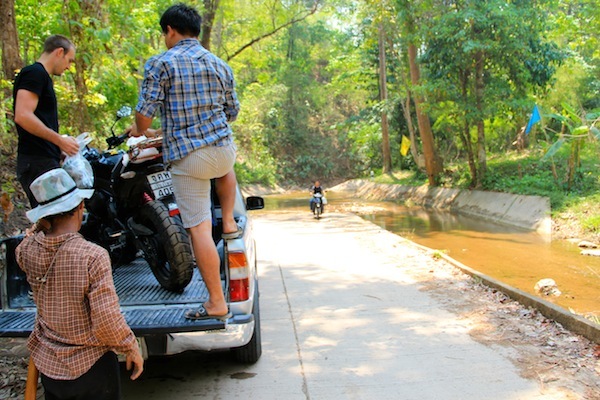 No longer an bike operator, but a mere passenger… I received thorough instructions on riding a motorbike through water. See. slowly… no brake… No accelerate inside the river… Seeeee? Anyone who happened to be passing by stopped and gathering around to discuss all possible options for getting us back on the road. As the entire conversation was in Thai… I could do nothing but stand there in silence as the odd burst of laughter broke out… knowing in all likelihood it was my riding skills that were the but of the joke. In the end we loaded the battered Kawasaki into the back of a ute and nursed it back to our guesthouse to wait for Joe’s arrival. it was a fascinating scene. … rode the approx 235kms via Pai in the fierce midday heat to collect his road bike that I had crashed & broken… stupidly trying to ride through a river, and he even hauled a replacement bike with him all the way so we could finish the journey that we’d started. Now that my friends is A1 service! 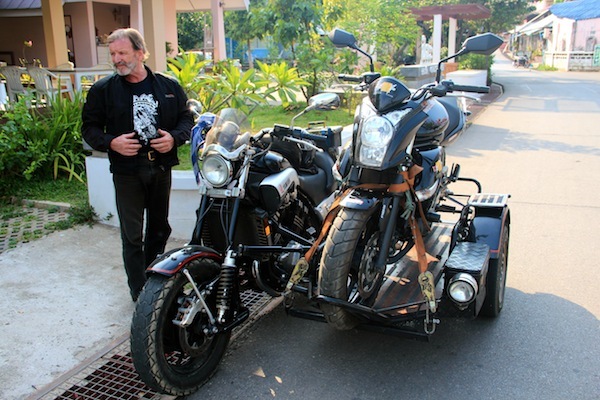 Mae Hong Son Loop – Day 4.
hoping dearly to make it all the way back to Chiang Mai without any damage to bike No 2. 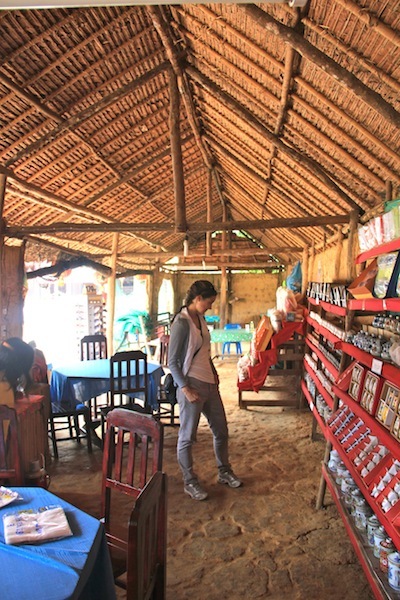 A small Chinese settlement right smack bang on the border of Thailand & Myanmar… Ban Rak Thai is an isolated community making a living mostly by cultivating tea. Yet again, as it was with so much of our trip… we were the first, and only tourists to visit Ban Rak Thai that morning. Dismounting and wandering into a small tea shop for some “tea tasting”. I would have loved to have spent a night in Ban Rak Thai… & like so many other places I’ve visited around the world… I like to think I’ll get back there some day. 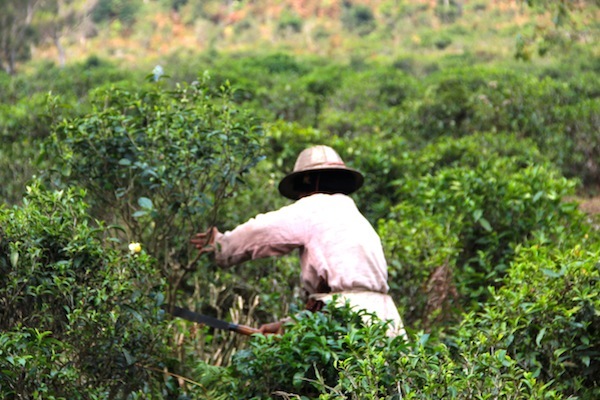 Such an isolated community, Chinese people in a foreign land, growing tea for a living, so close to the Burmese border – it’s an intensely curious & interesting town. In any case, we had to travel on to Soppong before tackling the final stretch of 145kms or so through Pai, then on to Chiang Mai, back where it all began. With a bag of tea, and a new teapot strapped to the back of the bike with the rest of our gear, we drove out of Ban Rak Thai after a brief but thorough nosey around. It’s an incredible little town & I would thoroughly recommend a visit if you ever get the chance. Our next planned stop was ‘Fish Cave’ – which as we found out is a not really a cave, but more of a hole in the hillside… next to a stream that’s abundant with large fish. 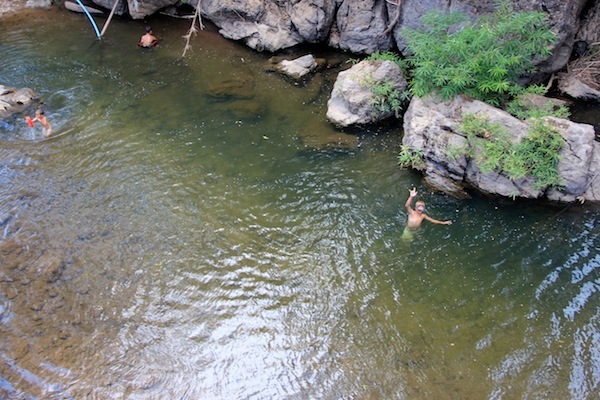 The Road from Ban Rak Thai to Sappong passes right by Fish Cave… so we pulled in for a look. The first thing we noticed was how serene the massive manicured gardens and camping ground were. The place is amazing. A little slice of heaven dropped by the side of the Road in Northern Thailand. A beauty that you’ve got to go and see for yourself. The perfect place stop on the way to Soppong for, lunch and a rest under a big shady tree. We nearly rode right on through Soppong it was so small… if we had blinked I swear we would have missed it completely. The major drawcard here is Tham Nam Lod (Lod Cave) and the Little Eden Guesthouse. 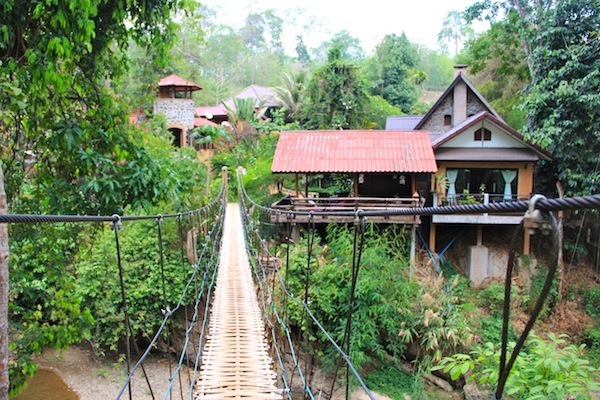 … lush green foliage wraps around the swimming pool, and a little further towards the rear of the property you come across a suspension bridge dangling over the river below… where the local children swim to cool off during the dry hot day. 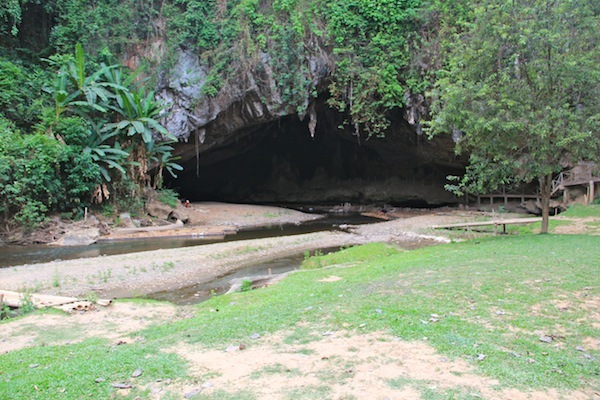 We rode out to Lod Cave, roughly a 20 minute ride out of Soppong… excited by the thought of floating on a bamboo raft into the depths of a deep, dark cave. 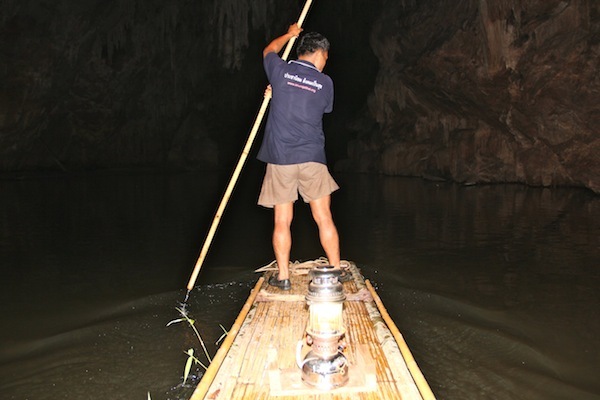 On board a bamboo raft, our guide paddled us into the depths of the Cave where we disembarked to explore further into the Cave on foot. With no source of backup lighting inside the cave… it’s a little intimidating knowing that you’re completely reliant on one ancient kerosene lamp to get you into, and more importantly, out of, a deep cave safely. The old Kero lamp cast shadows on the caves surface – breathing life into the walls & ceilings of the otherwise dark and lifeless cave… the light moving along the surface slowly until finally dissipating entirely when our guide moved into the next area of the Cave. Sharing the cave with little winged creatures with fangs was never far from your mind… as we could hear and smell the bats clinging to the ceiling above us everywhere we went. A pricey but interesting experience. 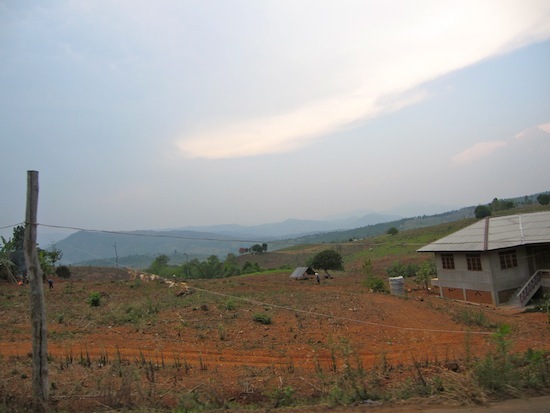 Mae Hong Son Loop – DAY 5. 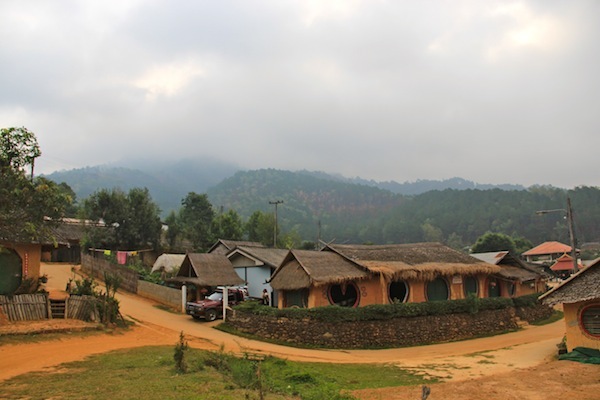 Asia’s hippie/alternative epicentre… Pai was the last unseen town on our Mae Hong Son Loop adventure. We rode into Pai in the early morning with not a great deal stirring in town. Famous for it’s coffee, & being morning, we thought it prudent to stop at a coffee shop & sample the local brew before taking a short walk around the streets to get a better feel for Pai. 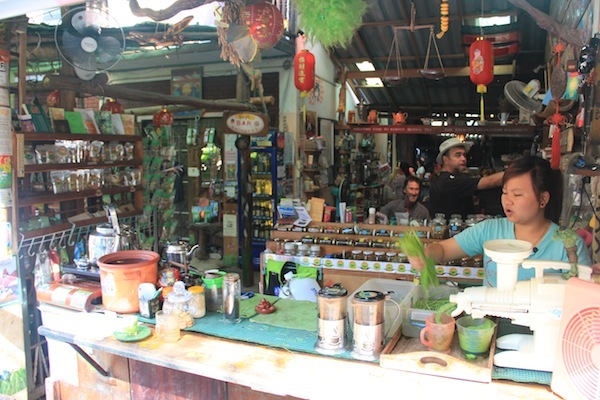 Overwhelmed with coffee & juice shops offering wheat grass shots and all other kinds of organic foods & supplements… the town really was a hippie hangout. 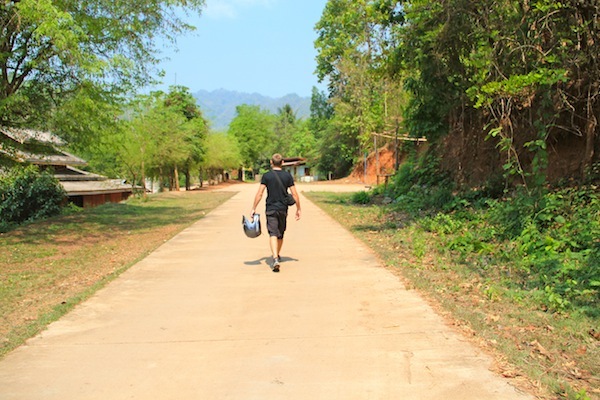 Keen to move on to Chiang Mai we didn’t spend a huge amount of time in Pai… maybe a couple of hours, but I think it was long enough to realise that it doesn’t deserve all negative press other travellers are so keen to dish out. 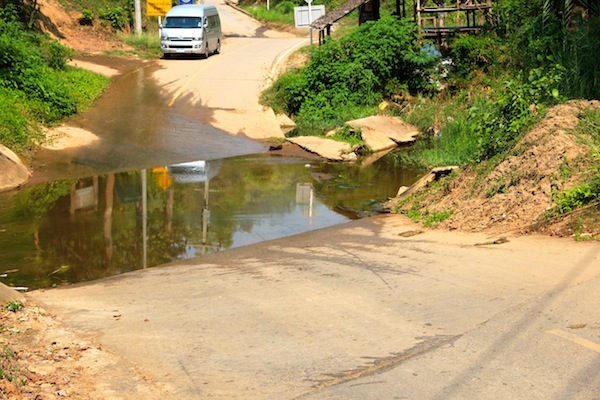 The Pai to Chiang Mai Road is not only the WORST Road on the Mae Hong Son Loop… But the worst we experienced in Southeast Asia (with the exception of the Road from Luang Prabang to Vang Vieng in Laos). A solid hour of steep climbs & hairpin bends on a surface of black Road so slippery the surface shines and reflects the suns light like a mirror. By the time we got to the bottom of the hill I wasn’t sure I’d ever sit again. Although we were stiff & sore (unlike anything we had felt in the previous 4 days) … we were saddened that our adventure was so close to it’s end. In a few kilometres we would ride our motorbike into Joe’s shop, kick the stand down, slide our helmets onto the shelf where we first tried them on a few days beforehand, and place the keys to our bike in his hands for good. … eager to start the day anticipating the unknown adventures the road before us would bring or the exploring that what was waiting for us in the next town. So after nearly 1000kms, 52 litres of fuel, many towns and villages, and 2 motor bikes… we had conquered the Mae Hong Son Loop, met some amazing people and had the road trip of a lifetime! Great read about a great ride! Shame about that poor bike, but it’s neat that you were able to get a replacement so quickly! It certainly was a great ride… can’t recommend it highly enough. Joe was incredible, we couldn’t have done it without him! I also detest waking up early.You got a hell of a motor cycle, nyce pic. Great read! I’m doing this loop in a few weeks with my boyfriend, but we’re both motorbike novices. Given your experience, would renting a bike be a terrible idea for a beginner? The road can get a little hairy at times, Are you planning to ride the loop as a passenger on your boyfriends bike, or hire your own? If you’ve never riden before, & you want to ride your own bike around the loop, I would recommend low powered bikes (like a 250) some even do the loop on scooters but it’s slow going. If you give yourself plenty of time to complete the loop and don’t force it, you should have an amazing time as beginners. What a fabulous trip report, had me laughing all the way through it. We did the North West tour of Vietnam from Hanoi to Sapa last year, very similar length of trip with very similar road conditions and loved every minute of it. Reason I found this report is that we are thinking of doing it next Feb. Your report has made me want to even more. Thank you for sharing your adventure. My boyfriend and I want to do the loop but don’t want to bring our big bags with us. Suggestions as to where we can store them? 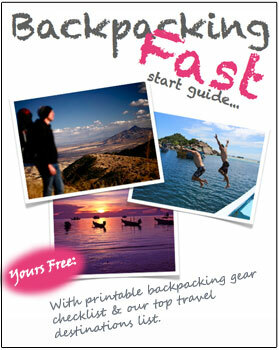 We’d just bring our day bags with the bare minimum to get us through the few days on the road.